Rather like breakfast, lunch seems to be one of those meals we grab, eat as quickly as possible, and forget. Many of us eat lunch at our desks, in our cars, between classes or meetings, or in some cases, forgo it in favor of candy and snacks from the vending machine. Even though time is limited, we should give a little more thought to lunch. What and how much we eat will determine how alert we are the rest of the afternoon, and set us up, for better or worse, for what we may choose to eat at dinner. Eat a lunch that's high in fat and carbs, and we'll likely feel bloated and sluggish. The best option is to make your own lunch. Who has the time, you might think? Well, think of it this way, while it would require an extra 10 minutes in the morning, or the night before, it will save you time later, as you won't have to spend part of your lunchtime finding lunch. So, what to eat? 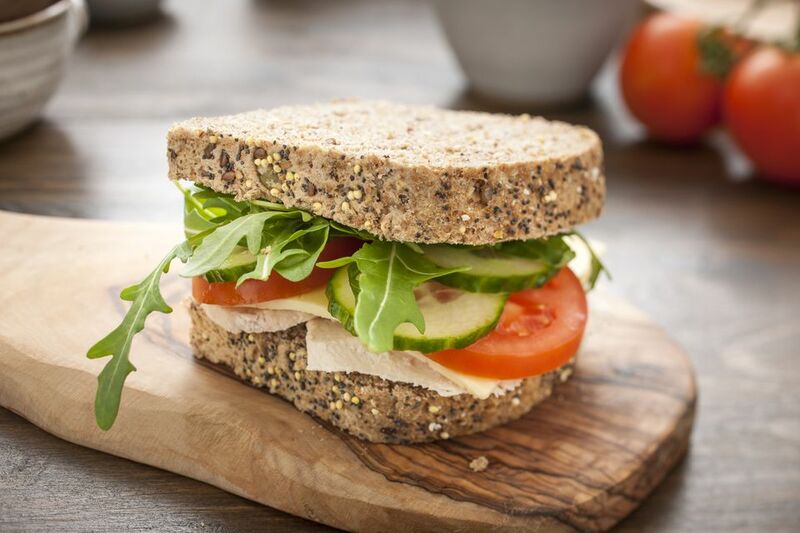 In a nutshell, whole grain bread, lean meats, reduced-fat cheeses, lots of vegetables/salad items for crunch, light mayo or mustard instead of full-fat mayo, broth-based soups, and fresh fruit. Soup and a sandwich can be a great combination, so long as you steer clear of cream-based soups, and sandwiches piled with mounds of meat, cheese, and mayo-filled chicken/tuna salads. Dig out your thermos and fill it with a low-sodium vegetable or chicken noodle soup to enjoy with a half sandwich filled with two or three slices of thinly cut, low-sodium deli meat, shredded veggies, light mayo or mustard. Wrap it Up! Replace bread with a whole-wheat or spinach wrap, add a little Dijonnaise, or tangy plain nonfat Greek yogurt, or perhaps a little salsa, and fill with shredded cooked chicken breast, spinach, and chopped tomatoes. Another great substitute for mayonnaise is heart-healthy avocado, which you can mash and spread on a wrap, or some hummus. A thinner bagel with light cream cheese. Thin bagels and buns are available in the packaged bread aisle. Choose a whole grain variety, and enjoy with some light cream cheese. Add some sweet pepper slices or red onion for crunch, or a slice of turkey for added protein. If you prefer to sink your teeth into a thicker bagel, you should choose a mini bagel instead of a thin one. A lighter salad filling. If you love egg salad, tuna salad or chicken salad, replace full-fat mayonnaise with low-fat mayo. Plain nonfat yogurt is a nice tangy alternative and works well with chicken and tuna. Add dried fruit, chopped or shredded vegetables into chicken and tuna salads, too. Pack your own salad. Fill a reusable container with salad greens (the darker, the better), tomatoes, sliced peppers, chickpeas, red onions, and cucumbers, and top with some chopped or shredded cooked chicken breast. Bring a small tub of low-fat or fat-free salad dressing to add when you're ready to eat. So these are just a few ideas for lighter lunches. You'll save money, time and your waistline.